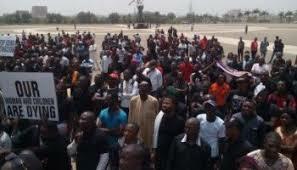 Hundreds of youths on Wednesday stormed the popular Food Basket Roundabout in Makurdi to protest the alleged killing of at least 33 people by herdsmen in Benue State. The protest led to a gridlock in the area, causing traffic obstruction for motorists travelling through the state capital to the north and southern regions of the country. The aggrieved youths have called on President Muhammadu Buhari to intervene in what they described as “terrorist killings” in their state. 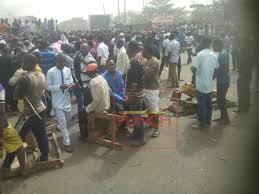 Some of them were in tears as a vehicle conveyed another corpse into the crowd to prove their claims of the ongoing killings, following a reported attack which occurred on Tuesday night. The protest came barely 24 hours after the State Security Council meeting which held at the Government House in the state capital. Addressing reporters shortly after the meeting on Tuesday, the state governor, Mr Samuel Ortom, said he had received reports of 20 persons allegedly killed by herdsmen in the state. During an on-the-spot assessment visit to some of the affected communities, Governor Ortom said an additional 13 deaths were discovered, taking the number of those killed to 33. The governor, who was addressing some members of the affected communities, said: “Mr President has been briefed about this development, all the security chiefs have been briefed, and our Security Council today directed that security men should come and protect lives and property in this community. The killing of another resident following Tuesday’s reported attack sparked the protest by the youths who have asked the President to come to their rescue. In a bid to contain the protest, personnel of the Nigerian Police and Nigerian Army were caught up in a faceoff with the irate youths who insist on occupying the road all through the week.